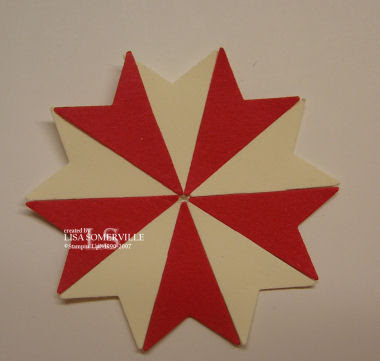 Going along with Last Fridays Bloggers Challenge "get punchy", I've posted a Pinwheel Tutorial. Pat posted a challenge on her blog Friday to try a punch flower. While at the SU convention in Denver, they had showed a pinwheel card using the SU Star Punch, so I gave Pat's challenge a "go" using the idea that was presented at convention. Using the star punch, punch out 5 stars from the vanilla card stock, 5 from the Dashing DSP, and 10 from the red card stock. Cut off both of the side points so it now looks like an arrow (see black lines on above sample). Repeat on all star pieces. Using the vanilla card stock, punch out a 1 1/4" circle - find the center and mark it with the piercing tool. Adhere one vanilla arrow to the 1 1/4" circle, so that the point touches the point you made with the piercing tool. The other end will extend past the edge of the circle. Continue to place the arrows on the circle, alternate between vanilla and red. Once you have finished, adhere a 1/2 of a dimensional to the backs of the remaining red arrows and layer onto of the red ones that are on the circle. 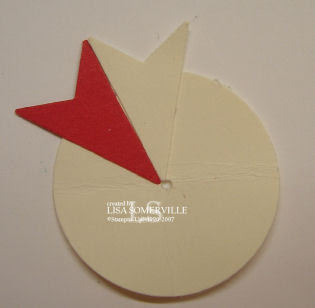 Punch a 1/4" circle from vanilla card stock, place on top of your pinwheel. Pierce with piercing tool and adhere brad. Place the Dashing DSP arrows onto the vanilla arrows. 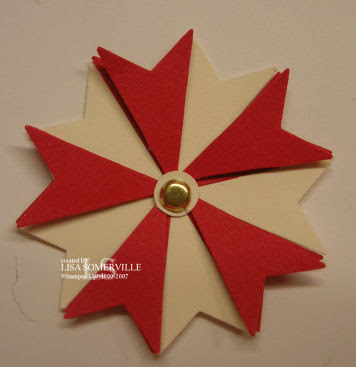 Cut a small strip of red card stock and adhere to back of pinwheel with a dimensional. Adhere to Dashing DSP. 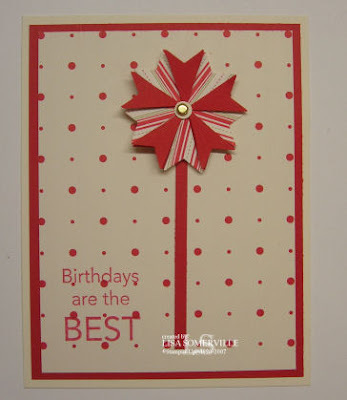 Stamp sentiment in red, layer onto red card stock, than vanilla base card. This is a great idea, Lisa! Thanks for sharing. 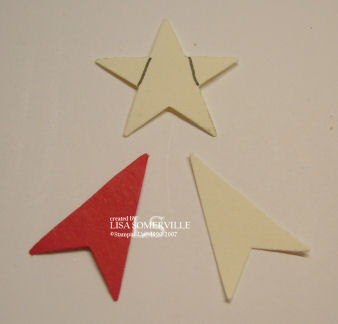 Honestly Lisa - I'm staying away from this blog for awhile - you are killing me - Now I have to order this darn star punch! I've already ordered Jolliest of holidays, ornament chipboard and yep, the list goes on - you're costing me money!! Love the look of this pinwheel! Now that is something I may be able to do with 'one wing'.....while my wrist is recovering! What a neat idea. Thanks for sharing!